How Can Obama Be Arrested And Jailed? It is a very pleasant thought, but Obama is the head of the national police forces and the Commander-in-Chief of the military. From a practical point of view, it is not possible to arrest him. The only constitutional way to arrest him is to impeach him in the House of Representatives, convict him in the Senate and remove him from office. After that he can be held responsible for crimes that he has committed and imprisoned or otherwise appropriately punished. To arrest him before removing him from office would be a banana-republic-style coup. 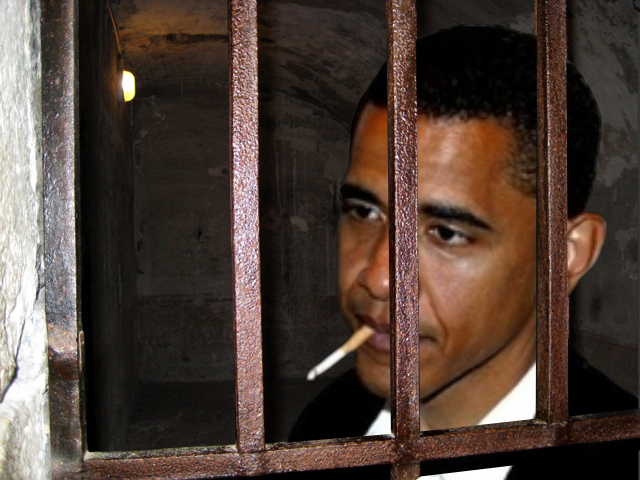 It seems the myth that he can be arrested before impeachment is often being spread around by some, who do not want Obama to be removed from office for whatever reason they may have. Some groups on the right have never raised so much money and never recruited so many new members as now when Obama is president. Some of them may not want the “good times” to stop rolling. “Jail Obama” signs are displayed at my own protests, but I mean after he has been removed from office according to the constitutional procedure. If Congress does not want to do it, we have to gather enough support to make them want to do it. The Framers of the Constitution did not mean to make it easy. We all have to join together and work for it. It would be a real shame to let Obama finish his term of office, as if he were a legitimate, law-abiding president. That would set a real new low point for the Presidency and the Constitution. The ultimate guarantor of the Constitution and Rule of Law is not the Congress, President or the Courts. It is the American People. Remember, we outnumber them nearly a million to one. Nothing is impossible, if Americans make up their minds they want it. The worst nightmare of corrupt politicians is that the People will unify against them.